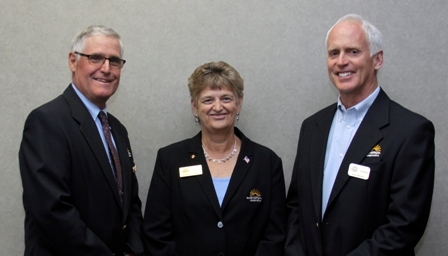 Newark, OH: Three incumbents were elected to the board of directors at the 78th annual meeting of The Energy Cooperative (TEC) held on Monday, May 19, at the Reese Center on the Ohio State University-Newark campus. Approximately 500 of the cooperative’s members and guests attended. Donald Hawk was re-elected to represent The Energy Cooperative’s District 1. Hawk has earned both the Credentialed Cooperative Director and Board Leadership certificates. Hawk is a self-employed farmer and has owned and operated Skyline Turkey Farm for the past 40 years. He has served as a township trustee, and soil and water supervisor and is a member of the Ohio Poultry Marketing Board and the Knox County Farm Bureau. Re-elected to represent the cooperative’s District 6, John Klauder serves as the secretary/treasurer to the board of directors. He also has earned both the Credentialed Cooperative Director and Board Leadership certificates and has been a member of the board since 2005. He operates John Klauder and Associates Landscape and Design. He has been a board member of the Licking Land Trust, Granville Chamber of Commerce and the Granville Rotary. Joanne Little was elected to represent the cooperative’s District 8. Appointed to the board in 2012, Little has completed four of the five courses required for the Credentialed Cooperative Director certificate. Prior to her retirement, she served as treasurer at Johnstown-Monroe, Newark City and Olentangy schools and also worked at C-TEC and Licking County Education Service Center. Since her retirement, she has served as interim and treasurer and financial consultant for many central Ohio school districts. In his report to members, Board President Nelson Smith said that after paying $60 million in debt over the past 10 years, The Energy Cooperative has achieved positive equity. “Now our next financial goal is to increase our equity position to a strong enough position for our bank to allow us to start returning capital credits. That won’t happen overnight, but we will never lose sight of that goal,” he said. Smith also said that as a result of a strategic planning session with the board and senior staff, a new substation is being planned in the New Albany area to improve reliability in western Licking County. Also approved was the expansion of The Energy Cooperative’s natural gas service to the Johnstown area. Among other highlights of the past year, Smith cited a new bill format rolled out to members that details breakdowns of all charges and explanations for them. Smith also mentioned that the board has been continuing to update its succession plan and also gave details on staff members’ involvement in community events, including the cooperative’s participation in the Savings Expo, Earth & Energy Day and Kids’ Day at the Work. “Thanks to all of you for making TEC look so good in the communities we serve,” Smith said. He also said that in 2013 all of the cooperative’s operations achieved another year of no lost-time incidents, continuing a record of safety. A new gas hauling contract for supply from the nearby Marcellus and Utica shale areas will save $1 million per year, he added. Smith also noted the passing of John C. “Jay” Barker, former chairman of the Operation Round Up board from 2005 to 2010. Barker had been re-appointed to the board in 2013 and most recently served as treasurer. In his report to members, President and CEO Todd Ware also addressed the positive financial news of the past year. He said that even though energy sales were flat, all of the cooperative’s businesses, including propane and natural gas sales, were at or above budget. The year’s comprehensive income of $17.1 million was higher than the $12.5 of 2012, and 2013’s equity of 5.6 percent was above the -1.1 percent of 2012. The major reason for the increase was a $12.9 million termination payment made by Anadarko E & P Onshore when it pulled out of The Energy Cooperative’s service area. In member services highlights of the year, Ware discussed the aggressive clearing and system improvements to reduce the number of electric outages. To reduce natural gas outages, a bare steel replacement program is continuing with about 10 miles of old pipe replaced last year, he said. To increase the ease of doing business with TEC from members, a new phone system has been installed, and another service to members is the informative 16-page newsletter, he added. Ware also addressed safety highlights of 2013. In addition to there being no lost-time incidents, TEC earned a recertification from the Rural Electric Safety Achievement Program and received a Licking County Safety Award as well as an Achievement Award from the American Gas Association. Addressing the matter of “most-asked questions” from members, Ware said that the proximity of shale gas in Pennsylvania and eastern Ohio has moved the supply closer to demand and had a positive impact on pricing. As for electric rates, even though the cost of purchased electric power has increased significantly in recent years due to $1.2 billion in environmental improvements at Cardinal Station, the power plant servicing Ohio’s cooperatives, those upgrades are now completed and the plant is now top of the line for emissions controls. Also speaking at the meeting was Bill Roberts, vice president of finance and chief financial officer at Ohio Rural Electric Cooperatives, (OREC) the statewide organization of electric cooperatives that The Energy Cooperative is a part of, and also of Buckeye Power, the statewide power provider to Ohio’s cooperatives. Roberts said that during this past winter, which was 10 percent colder than predicted, the electric grid across the eastern U.S. strained to keep up and fell perilously close to exceeding generation capacity. Because about 20 to 25 percent of the generating capacity in the region will be retired by the end of 2015 due to power plants that don’t comply with stricter environmental regulations, “we could be in serious trouble if we get the same cold weather in the next few years,” Roberts said. Because OREC has taken a long-term view and has been investing significantly in environmental controls, resulting in some of the cleanest coal-fired generation in the world, Ohio’s cooperatives are in a better position to deal with these environmental regulations, Roberts said. However, a looming threat is the Environmental Protection Agency’s (EPA) recent regulations to limit carbon dioxide (CO2) emitted from coal units. The EPA has already issued limits for new power plants, and in June it’s scheduled to issue limits for existing plants. “These new regulations would accomplish little at great expense, both to you in terms of skyrocketing electric rates and to the larger economy as the shock of these higher rates slows growth and results in widespread job losses,” Roberts said. Roberts told members attending the meeting that consumer and industry groups across the country have sent notices to the EPA warning of imminent state lawsuits should they proceed with their aggressive limits. He urged members to send postcards provided at the meeting to the EPA to join the public protest. “Help us let them know that what they do ought not be radical. It ought to be sensible,” Roberts said. School, Hannah Valente of Centerburg High School, Joshua Stimpert of Danville High School, Jacob Hopkins of Licking Heights High School and Henry McConaha, who was home educated. A new $2,500 scholarship from the Operation Round Up Foundation in memory of Bruce A Sumner was also awarded to Erin Mitchell of West Muskingum High School and Shiloh Jones of Tri-Valley High School. Scholarships of $2,000 were awarded by the Energy Cooperative to Sarah Holdren of Tri-Valley High School, Lauren Hoffman of Granville Christian Academy, Alex Robinson of Mount Vernon High School and Andy Gebhart of Newark Catholic High School. Runners up were Natalie Hurst of Licking Valley High School and Aran Whisler of Johnstown-Monroe High School, both of whom received $1,000 scholarships. Janet Gregory of Granville High School was selected to receive a $1,000 scholarship in conjunction with Touchstone Energy® Achievement.